I received a great question in response to yesterday’s post on what it costs to adopt from foster care: How much money are you expected to have as a potential foster care/adoptive parent? I say that glibly, but it’s the truth. All the expectations you might have about how they’ll be looking at your ability to provide the very best for the child(ren)? Throw those out the window. That’s not the standard at all. Organic food? Not a thing. Impressive job? Not a thing. Big house? Not a thing. Dedication to Montessori style learning? Not a thing. Provide some version of macaroni & cheese, hot dogs, and store-brand bread 3x/day. Pay the rent (or mortgage) on a living space that has at least 50 square feet of available room for the child to sleep. Arrange for transportation to get your child(ren) to school, the doctor, the dentist, etc. You won’t have to pay for those visits – they’re covered by Mass Health. But you need to be able to get them there. Sounds like I’m exaggerating, right? I’m not. The #1 thing you bring to the table as a foster/adoptive parent is STABILITY. If you earn a small amount of money, but know how to get out of bed every morning, do your work, buy food to have in the house, pay the bills, and function in a predictable, loving way? That’s the stuff. All of the luxurious extras we’ve decided are necessary to parent our children are just not part of the conversation when you’re talking about kids who don’t have a family or a home to grow up in. I’m not against the luxurious extras. But I think it’s important to lower the burden on yourself and create some room for children’s actual needs. The funny thing about adoption from foster care: Kids are kids. Even if you can afford organic food, your new kids probably won’t eat it. Kids like sugar. It’s a universal thing, and some of us were just super blessed to have grown up in the 1970s before anyone realized that a glass of Tang “breakfast drink” wasn’t the same thing as giving your child an orange. If you have an impressive job, your new kids probably won’t care. Kids like to have their parents around (even though they say the opposite). If you have a big house, start planning NOW for how you’re going to handle your new kids disappearing with their friends into all those rooms with no supervision. Because eventually, all kids become teenagers. And whatever style of education you believe is best, your child(ren) may need something very different, and you just won’t know until you’re in it. All that to say…it takes a lot to become a foster/adoptive parent. But it doesn’t take a lot of extra money. Have other questions about foster care/adoption? Let me know & I’ll try to answer here on the blog. Even if you’re just curious but don’t think it’s for you, you never know…your question might help someone else decide it is for them. This entry was posted in Adoption and tagged adoption, adoption from foster care, finance, Foster Care, money on March 9, 2016 by Trish Ryan. Steve & I didn’t realize it at first, but The Cherubs have had the most miraculous foster care experience of possibly any children in state history. They lived in one foster home – together. It was an excellent foster home that was high-structure, loving, and taught them an array of life skills. They are being adopted – together. They have experienced incredible loss. But they have each other, every day. This is rare. Last week, as I was looking through the Children Awaiting Adoption book at church, I realized that ALL the other sibling groups Steve and I inquired about before we learned of The Cherubs have been separated. They were each in different foster homes or residential settings to begin with. But now, in each case, this separation is permanent: one child has a forever family while the other does not. I have a hard time breathing when I think about that. When kids come into foster care, it is almost impossible to keep siblings together. They unromantic way foster care works, especially now that so many more kids are in danger because of the opioid crisis, is based on the question, “Where is there an approved bed?” So if there’s one bed in Dorchester, and another out in Sudbury, that’s where the kids are put. They won’t stay there, probably; they’ll get bounced around (because, shockingly, kids who have lived in absolute chaos and are then pulled from their homes with no warning and placed with absolute strangers tend to exhibit some, well, signs of stress. They’re not grateful and lovely; they’re terrified.) Add to this the number of homes that won’t take tweens or teens, and you have precious few options to place these kids anywhere, let alone together. Many end up in group homes, even though they’d be fine in family settings. There just aren’t any families to take them. I’m telling you, The Cherubs are BLESSED. I’ll piggy back on this and say that WE need foster homes that focus on keeping siblings together. This is where you come in. Not to put too fine a point on it, but you can do this. You can be single or married. Older (the Cherubs’ foster mom is in her early 70s) or younger (the age requirement is 25). It doesn’t matter if you rent or own your home. You’ll need running water, a support system of a couple of friends and family, and (my recommendation) some sort of faith in God. It can even be starter faith, like newly planted seeds. Trust me, it will grow. This will absolutely wreck your life. I’m not even kidding. It’s the hardest thing. But it’s a Gospel thing. Have you ever looked at that footage of the waves of Syrian refuges and thought, “That’s inhuman…someone HAS to take them in…”? Right now we have waves of children needing refuge, right here in our state. You can’t save all the kids. But you can pull a couple of them up out of the water, give them a safe warm place to be, and infinitely bless both them and their future adoptive family. That’s not a bad use of part of your life. Go here to learn more. You could be the solution to this problem. This entry was posted in Adoption and tagged adoption, Foster Care on February 24, 2016 by Trish Ryan. Oh My Gosh I love this book. I started it YESTERDAY. Finished it TODAY. It is 376 pages, including a center section with photos I had to keep flipping forward and back to as I got to certain parts of the story. I gave up sleep to keep reading, and sleep is my absolute favorite thing right now since I’ve given up all good food. If all this doesn’t say Must Read Page Turner, I don’t know what does. Walk to Beautiful is the memoir of country singer Jimmy Wayne. He opens with a scene of him onstage at Madison Square Garden as he opens a concert for Brad Paisley. Then he returns home to Nashville after the tour and reflects back on the dark, strange path that led him there. This is the part of the book that captured me, because Jimmy Wayne was a foster kid. He spent his childhood at the mercy of a mother who was a complete lunatic. She abandoned him time and time again–for men, for mood swings, for a chance to be free of responsibility and chase her selfish dreams. He grew up bouncing from home to home in foster care, mostly raising himself. The word harrowing is a fitting descriptor for his story, but resilient is equally apt. As I read I was so angry at the adults in his life and what absolute selfish morons most of them were (truly, it’s astounding how awful we human beings can be). But at the same time, I was pulling for Jimmy and inspired by how he kept going. The best part of this book was seeing how he took advantage of the few opportunities that came his way. He highlights key people who, each in their own way, gave him the pieces you need to build a life: discipline, structure, affection. His description of how he carried around small mementos of each person who had cared for him in some small way broke my heart and made me want to cheer, both. This is a both/and kind of book. Read this book. It is entertaining and inspiring. A great investment of time and money. And who knows? Maybe it will make you wonder about how you can play a role, big or small, in helping a kid who needs a good grown up on their side. Disclaimer: I received a copy of this book from the publisher in exchange for an honest review. I’m very glad about this. 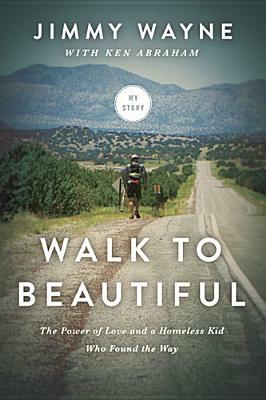 This entry was posted in Book Recommendations, Books, Inspired By and tagged Foster Care, Jimmy Wayne, Walk to Beautiful on October 16, 2014 by Trish Ryan.